Where is the Mount Sinai where God gave the 10 Commandments? Dr. Fleming: There is a problem with identifying the location. In remote areas you don't have people living at the same oasis where they can pass on a tradition from parent to son or daughter without break. Most of these areas are places of sojourn that they just go through. Of the more than 30 places in Exodus mentioned with names where the Israelites stopped, only four of them sound like any modern Arabic name, and in the desert those are the largest oasis where people lived. We have lot of questions. How large was the Sinai Desert at the time? The same question can be posed for the Wilderness of Zin, the Wilderness of Paran, etcetera. 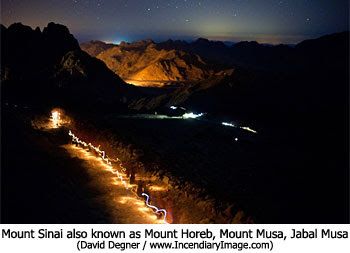 It is true, we just don't have good archaeological evidence for the traditional Mount Sinai — Jabal Musa — the Mountain of Moses. It has also been suggested that a site in Saudi Arabia had a volcanic eruption somewhere around 3,000 to 4,000 years ago and so we ask if that could be the fire and smoke of that biblical period. The problem is the Saudi's have not permitted any sound archaeological surveys there. To put all your eggs in one basket for a site that hasn't had proper excavation is very iffy archaeology. The earliest known tradition we have for that mountain is 250 AD. Again, we are talking about the Exodus period happening between 1400 and 1200 BC. There has been a mountain from the Nabataeans some 200 BC that we have found "x son of y was here," but it doesn't say why he was there. We just don't have enough to go on because it was a place of sojourn. 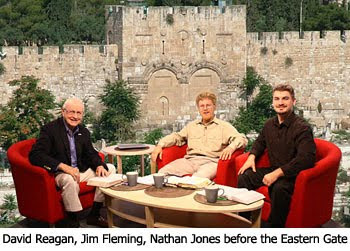 Who the heck are the nabatean? Can there be ANY doubt, with all that is going on, that these indeed ARE the end days? Billy you will get a crown of righteousness as all who long for His appearing. I have been unable to associate this with Isaiah 19 as that could have been fulfilled when Assyria conquered Egypt (Assyria known for it's cruelty)and later in 19 I think this is when Judeans fled to Egypt when Babylon began conquering Judea. I do feel current events are in Matthew 24 and James 5 (hoarding of gold). The kingdom against kingdom could be referring to the different tribes within these nations for example Libya. Keep looking up! I'll just be grateful to occupy a little tiny corner of our eternal abode and without Jesus I shouldn't even get that but because of Him I'll get a lot more. I just can't possibly begin to imagine nor fully appreciate the awesomeness of that.